The term “green-washing” refers to positive environmental attributes or labeling attached to products when, in fact, there is no scientific evidence or standardized testing to back the claim. Some common words or phrases used by businesses in reference to their products include that they are ‘green’, ‘eco-friendly’ or ‘environmentally sound’. But are they really? Presently, there are over 600 ‘eco’ logos worldwide tied into third party certification schemes. These programs decide whether a product is good enough to use its logo. One way to overcome the accusation of green-washing is to develop an Environmental Product Declaration (EPD) for your product—and the North American softwood lumber as well as the Western Red Cedar lumber industries are doing just that. An EPD is a document that provides relevant, verified, and comparable information about the environmental impacts of goods and services and offers real evidence of a product’s environmental footprint. The information gathered is verified by an independent third-party and enables comparisons to other products used in the same application on an apples-to-apples basis. Western Red Cedar (WRC) lumber producers achieved EPDs for their decking and siding products in 2011 through the Western Red Cedar Lumber Association (WRCLA), based in British Columbia. The WRCLA is a non-profit industry group with membership consisting of both WRC manufacturers and distributors, whose members represent 70 per cent of WRC production in the world. WRC grows along the Pacific coast from northern California to the southern tip of Alaska, with pockets also found in B.C.’s southern interior and U.S. inland northwestern states. It is used primarily as siding, decking, appearance timbers and for outdoor living applications. He adds that WRC’s third-party, certified, environmental performance demonstrates WRCLA’s commitment to provide accurate, verifiable, information. Part of the association’s motivation for pursuing an EPD is the erosion of market share—to plastic composites and concrete—that its products are witnessing in certain building applications. Draper says the association’s members have benefited because the environmental studies that underlie the EPD clearly show that in building applications where WRC, plastic composites and concrete products could be used, WRC comes out as the clear environmental winner. The association has focused considerable effort in communicating this information to architects and designers because Draper says they are the ones who demand the greatest amount of evidence when it comes to environmental footprint claims. They also have considerable influence on the selection of building materials, particularly on projects where environmental impact is an important consideration. WRCLA is also sharing its EPD information with consumers and builders as part of a comprehensive promotional program. In terms of tangible rewards, Draper says given the current economic climate, product price still tends to be the dominant factor in purchasing decisions. In future, however, he adds that having the EPD clearly provides a significant competitive product advantage and will certainly result in positive returns for their members. He recommends that other wood product sectors pursue EPDs. The association collaborated with FPInnovations to meet all of the EPD requirements. FPInnovations used this opportunity to concurrently develop the Product Category Rules for producing an EPD for North American structural and architectural wood products. Developing the rules is the most difficult task in the EPD development process—and because they have already been developed for the wood industry, this gives it a significant head start over its concrete, plastic composite and steel competitors. 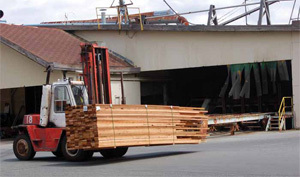 Western Red Cedar lumber producers achieved Environmental Product Declaration for their decking and siding products in 2011 through the Western Red Cedar Lumber Association (WRCLA), based in British Columbia. The American Wood Council (AWC) is leading the North American softwood lumber EPD initiative, using Product Category Rules for North American structural and architectural wood products developed by FPInnovations in Canada. These rules were developed based on standards set out by the International Standards Organization (ISO) on the procedure that must be followed for gathering the data used to produce an EPD, and involves input from a wide variety of stakeholders. It is essentially the rule book that industry must follow if it wants to prepare and complete a legitimate EPD. In addition to setting the rules for lumber EPDs, FPInnovations’ work has also set the rules for potential EPDs for panel and composite wood products. “Basically, we built the highway and now folks can drive their cars down it. I think it is tremendously positive because it gets us a little closer to getting the environmental benefits of wood recognized in the marketplace,” says Jennifer O’Connor, group leader for energy & environment in the building systems program at FPInnovations. Nothing is stopping the concrete, plastic composite and steel industries from developing their own EPDs, and it is to the wood industry’s benefit if they do. The concrete industry is working on Product Category Rules right now in advance of producing an EPD. 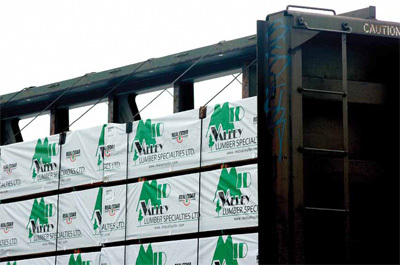 The AWC is developing the softwood lumber EPD so that all North American softwood lumber producers will be able to share the information with their customers. It is taking this approach because the differences in softwood production from one mill to another are minor and softwood lumber producers do not want to use this information to compete against each other, but to compete with other building materials instead. No further action will be required by individual softwood lumber producers once the EPD process has been completed. Companies may choose to promote the EPD on their web pages, label their products as having undergone EPD scrutiny, attach EPD information with each bundle, or company marketing personnel may choose to distribute the EPD document to their customers. Typically, an EPD will look like a 10 to 12 page annual report or product brochure. The goal was to complete the North American softwood lumber EPD by spring, 2012. 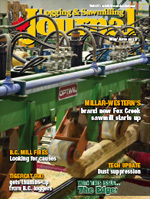 The wood industry wants to be among the first in North America to have developed an EPD. Back at the turn of this century, Europe began developing standardized processes and tests that result in third-party verifiable evidence of a product’s actual impact on the environment, taking into account both the process used to manufacture the product and the product’s impact on the environment once on the market. The result is an EPD related to that product. While not promoted as a seal of approval, what an EPD does is provide buyers, who have an interest in using environmentally-friendly products, with a means of making side-by-side comparisons of the available options and their impact on the environment, leaving them to make their own product selection based on their requirements. This is similar to consumers comparing nutrition labels on food packages. While a softwood lumber EPD represents a powerful marketing tool when competing with other building materials, it may also become the price of admission for doing business in some markets in future. Requiring a wood product EPD could become a legal trade barrier to entry into some key markets. Europe and parts of Asia are a decade or more ahead of North America in developing industry-specific EPDs. New European Union (EU) regulations have already been proposed that would mandate the use of EPDs in the construction industry. It has already developed EPDs for oriented strandboard (OSB), particleboard, plain structural timber, sawn-dried timber and glulam products. Also, Japan’s Environmental Management Association for Industry (JEMAI) started an ecological labeling program in 2002, and is considered a world leader in EPD development. In terms of Canadian wood industry knowledge about EPDs, it’s still a rather new concept with some, leaving them wondering if this is yet another certification program. FPInnovations’ O’Connor is quick to point out that it is not. At present, most of the conversation related to EPDs is tending to take place at the CEO level because interest in EPDs at present is being driven by organizations like the Binational Softwood Lumber Council.